The housing market is a tricky industry to navigate. As a home seller or buyer, you must be well-versed in the real estate process to avoid breaching agreements or wasting funds. Fortunately, you can perform successful transactions by working with a reliable title company in Bethesda, MD. Eastern Title is a premier title company in Bethesda, MD. We are staffed with seasoned agents who perform in our clients’ best interests. From drafting purchase agreements to conveying property titles, our services are designed to simplify the real estate process. Turn to our title company in Bethesda, MD for your needs. Real estate transactions involve possibly confusing procedures. To complete one, you may need to work with lenders, appraisers, home inspectors, or other professionals. The signing of various legal documents is also typically required. If you are not careful, problems could arise before closing and cause a delay in the real estate process. You can avoid conflicts by hiring representatives of title companies in Bethesda, MD. At Eastern Title, your satisfaction defines our success. Our title company in Bethesda, Maryland guarantees the smooth completion of your transactions. Whether you need help in refinancing, issuing title insurance, or conducting title searches, you can rely on our reputable title company in Bethesda, Maryland. A top-notch title company in Bethesda, MD has notable experience. Before you work with a title company in Bethesda, Maryland, look at its history. Do title companies in Bethesda, MD have enough experience? How long have they been in business? You’ll learn whether or not to trust a title company in Bethesda, MD by gauging their experience, or lack thereof. Our title company in Bethesda, Maryland has more than 20 years of combined experience. In the years of maneuvering the housing industry, we have acquired considerable real estate skills and knowledge. Our representatives are also trained to effectively resolve sale disputes. 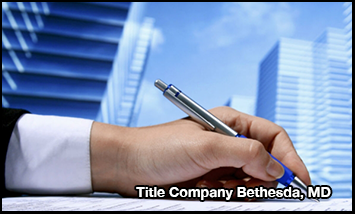 By working with our title company in Bethesda, MD, you can avoid title mistakes and complete a hassle-free transaction. Top-notch title companies in Bethesda, MD has excellent customer service. Excellent customer service does as much for a title company in Bethesda, MD as its broad experience. Look for a title business in Bethesda, Maryland with not only intelligent but also courteous representatives. Our title company in Bethesda, MD makes the real estate process easy for our clients. With the help of our exceptional agents, expect to be skillfully and patiently walked through the concepts of the home selling or buying process. We’ll also ensure that you make well-informed choices by providing valuable information and assisting you every step of the way. At our title company in Bethesda, MD, your real estate business matters. At Eastern Title, we go the extra mile to provide client-focused solutions and meet expectations. In fact, our title company in Bethesda, MD can serve clients in five languages. Apart from English, we complete purchase agreements, handle closings, and convey property titles in Spanish, German, Chinese, and Vietnamese. This proves our dedication to cater to every client’s individual needs. If you are searching for exceptional title companies in Bethesda, MD, look no further than Eastern Title. The process can be tough to handle, especially if you are a first-time home seller or buyer. The good news is you can have the procedures simplified by hiring our experts at Eastern Title. Call us today. To learn more about our title company in Bethesda, MD, feel free to visit our website.